Here’re some kitchen display ideas to maximize kitchen space and make a feature of your favorite objects for all to see. Hanging rails are great to have around the cooking area. I like them to be above the hob on a tiled surface or at the side of a range of cooker or food preparation area. You can also create a rail system by having them above the island unit. 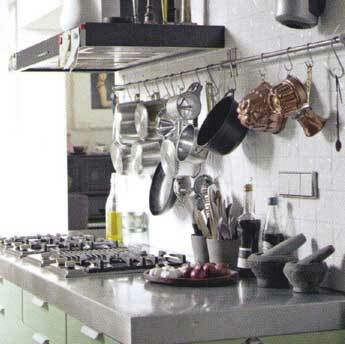 For the picture above, you get to see how pans that used daily are hung from chrome rail placed beneath the cooker hood. Open display units make great display ideas. This can take the form of pigeon-hole shelving, either free-standing or attached to a wall. A unit with shelving in which displayed objects take centre stage works too! The simple display unit above consists of a backing made from reclaimed timber. This forms a textured backdrop for a collection of everyday glassware and ceramics. 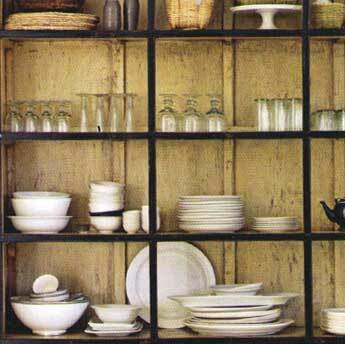 It makes sense to store and display everyday china and glassware so they’re at hand. 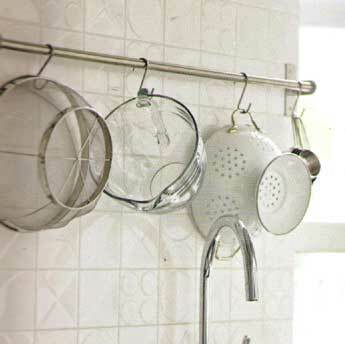 For the seldom used but pleasing platters or utensils, place them higher up the display ladder. 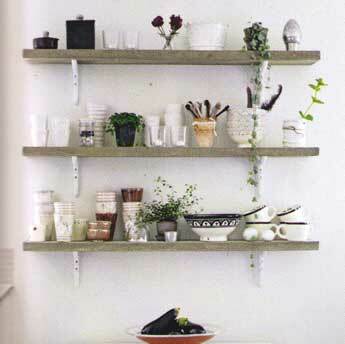 The concrete shelves attached to the wall add texture to the all-white color scheme. The relaxed feel is enhanced with the display of everyday ceramics and small pots of plants. 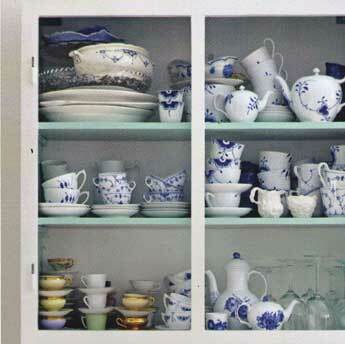 When storing china, group them according to color or style for more impact. Make sure the precious pieces are stable and secured. The classic collection of blue and white porcelain with glasses, coffee cups and saucers looks informally at home in the wall cabinet above. Having the plates mounted above the stainless steel splashback is an example of witty kitchen display ideas. 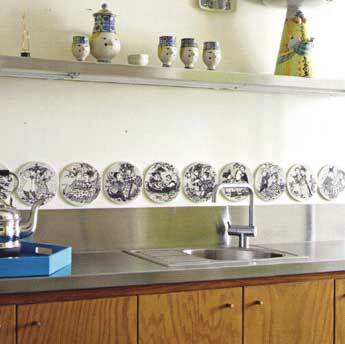 The wall mounts double as storage once the plates are washed. Click on the text to return to the top of kitchen display ideas.